The Mining and Pastoral Monument acknowledges the role of the mining and pastoral industries in the development of Cobar. 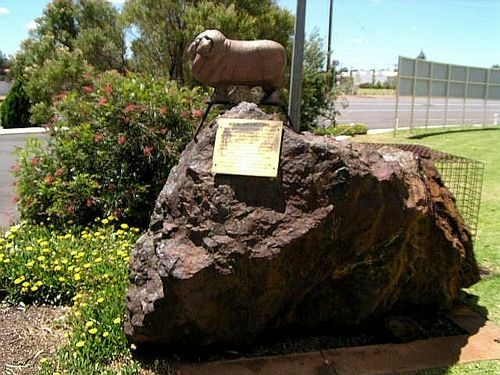 This Monument Was Erected In 1969 By The Cobar Museum Committee To Acknowledge The Roles Of Both The Pastoral And Mining Industries In The Development Of Cobar. The Museum Project Was An Initiative Of The Cobar Rotary Club, Who In 1967 Negotiated With Cobar Mines Pty Ltd For The Donation Of The Old Office Building To The Cobar Shire Council. During The Following Two Years The Lions And Apex Clubs Also Joined The Project. The Ore Is From The CSA Copper Mine And The Ram Is An Example Of The Once Familiar Golden Fleece Petrol Advertising Signs.